The Wildlife Center of Virginia provides state-of-the-art veterinary care to sick, injured, and orphaned wild animals with the goal of returning them to the wild. 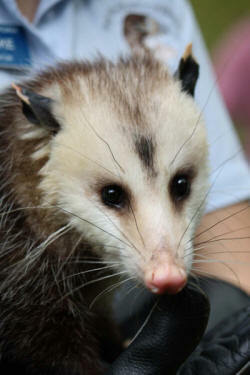 Among the more than 2,500 animals admitted in 2009 were 38 bald eagles, numerous robins and box turtles, a hog-nosed snake, 2 beavers, and a wood rat. Since its founding 1982 the Wildlife Center has treated over 50,000 animals, trained veterinary, conservation, and rehabilitation professionals from all over the world, and brought environmental education programs to more than 1.4 million people around the state, most of them children. The Wildlife Center’s Environmental Education Department provides tours of our Waynesboro facility, guided hikes in the adjoining George Washington National Forest, and off-site assembly programs. Our programs focus on topics such as habitat and habitat loss, the dangers of litter to wildlife, and the inter-connectedness of the food web, and are brought to life by the appearance of non-releasable wild animals whose stories illustrate the problems faced by wildlife. For example, a program might include Pignoli, an Eastern screech owl who lost an eye after colliding with a window, or Ferdinand, an opossum who was orphaned and sustained injuries due to a collision with a car. 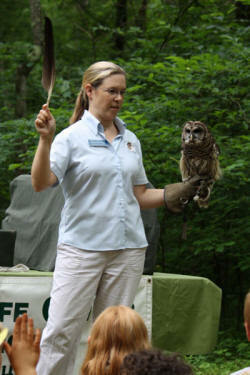 More information about the Wildlife Center of Virginia can be found at www.wildlifecenter.org.